That’s the determination of one parent to try and gain access to his daughter, and to raise the important awareness about parental child abduction. Steven Monk-Dalton has now embarked on the walk of a lifetime; from Orihuela to London in a 44-day journey in support of UK charity Reunite International, which helps families affected by child abduction. 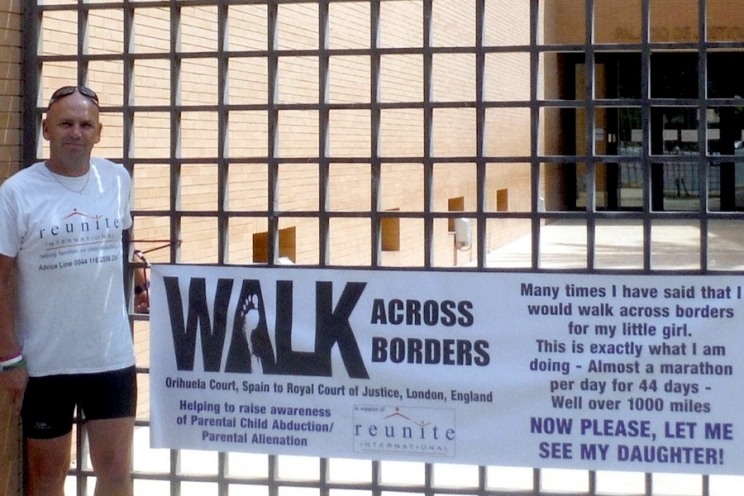 Steven has been planning the Walk Across Borders challenge since February this year and set off from the Orihuela Court on Sunday August 23. His epic 1,082-mile walk will take him north through Spain and France on to the UK, finishing at the Royal Court of Justice, London, in early October where around 30 people will join him in a demonstration. Already Steven has raised around €1,700 and had support along the start of his journey as Alison Shalaby from Reunite joined him for the first few days of the walk along with volunteer Michelle from the One Day Closer charity shop Steven set up in Villamartin Plaza. Maurizio Rigamonti flew over from Italy to drive the support car and follow Steven. He had his child returned home to Italy from America via the Hague Convention but is still denied any access to his son. Steven hopes more will join him at the various stages as he plans to walk a marathon a day, and this weekend he should be crossing through and stopping off at La Torre, Landete, Libros, Caude and Monreal del Campo. Steven is raising money for the charity having been one of the thousands of parents who contacted them for help and advice after his daughter was taken back to the UK by her mother without his consent. It has been five years since he has had any contact with her and she turns 10 this month as Steven is on the walk. He said he had fought for years through the courts and even hired a private detective in the UK to track her down so he could at least know where she was. For more information on Steven’s cause and follow his challenge or to make a donation, visit his blog at http://walkacrossborders.blogspot.com.es/ or search Walk Across Borders on Facebook. This entry was posted in Uncategorized and tagged Lawyers, Maurizio Rigamonti, Orihuela, Parental Abduction, Parental.Kidnapping, Reunite, Spain, Steven Monk-Dalton, Walking across borders, Walkingacrossborders. Bookmark the permalink.